Otaku Encore: Cosplay Idol is now taking another area in order to search for COSPLAY + TALENT in one. On January 20, 2013 COSPLAY IDOL FEVER will invade SM CENTER VALENZUELA. The question is WHO WILL BE THE NEXT COSPLAY IDOL? With 150 points to gather which includes cosplay power (performance + characterization + costume and accuracy + overall appeal) and talent, everyone can be the next cosplay idol. This event is FREE ADMISSION and you can REGISTER ONLINE until Thursday, January 18, 2013 at 11:59pm. For more details check out the guidelines and other mechanics below. Do visit our FB EVENT PAGE as well. ORGANIZER: SM Center Valenzuela and Naruto Cosplayers PH (NCPH) in cooperation with Red Cloud Events and Productions. REGISTRATION FEE: P55.00 (1 Eco Green Bag and 1 SM bottled water to support SM’s environmental campaign and clean water drinking water for the youth of Mindoro). All previous winners are disqualified to compete in the same category that they won. All costumes that have already won in previous Cosplay Idols which are made and owned by PREVIOUS WINNERS are disqualified regardless who would use them. Winners who have won as COSPLAY IDOL cannot win again for the same title. 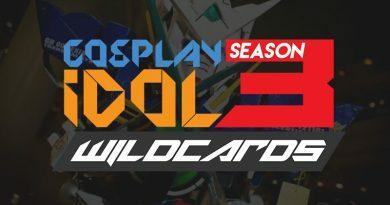 Cosplay Idol Champion – P5,000 worth of SM Gift Certificates. Best Anime – P3,000 worth of SM Gift Certificates. Best Game – P3,000 worth of SM Gift Certificates. Best Child – P3,000 worth of SM Gift Certificates. 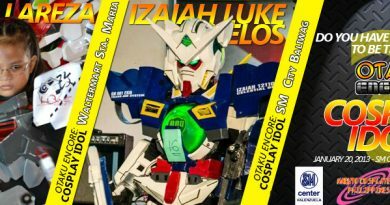 Best Mecha/Armor – P3,000 worth of SM Gift Certificates. Best Naruto Series Cosplay – P2,000 worth of SM Gift Certificates. 1. Every cosplayer who enters the competition will get a change to win the COSPLAY IDOL AWARD. 2. The total points to be given for the cosplay competition will be 150 points. The additional 50 will be used to compute for the Cosplay Idol category. 3. A cosplayer who wins in the Cosplay Idol Award can no longer win for the Individual Cosplay Award. 4. You can perform as a group and win in the COSPLAY IDOL COMPETITION as long as their individual character average plus their collective talent will be the highest. Meaning isa lang ang bibigyan ng score sa talent ng buong group. 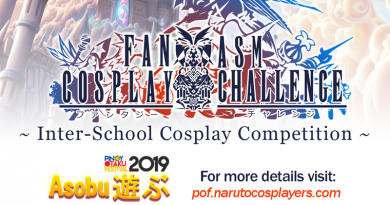 All members of the group performance should register and once they win as COSPLAY IDOL they win as a group and no member from that group can win in the other categories. Best Mecha/Armor Type – all cosplayers who are cosplaying a Mecha or those whose costume are 60% composed of armor. This category rules will strictly be implemented. Best Anime– all cosplay which are based on anime series except Mecha, and Child. Best in Game – all cosplay which are based on games except Mecha, and Child. Best Child – all cosplayers age 12 and below except if they opt to compete on other categories. Best Naruto Series Cosplay – all cosplayers who are cosplaying character from Naruto and Naruto Shippuden anime series, manga or game. 3. All pre-registered cosplayers are required to confirm at the venue from 10:00am to 1:30pm. 1. Dangerous stunts, metal props and other dangerous objects or props will not be allowed. 2. In case of destruction or damage due to a contestants cosplay act, the cosplayer will be the one to answer for the said damages. 1. COSPLAY COMPETITION = Judges scores on Characterization + Costume and Accuracy + Performance + 5 RANDOM AUDIENCE score on Overall Appeal. 2. COSPLAY IDOL = Cosplay Competition Total Score + Judges score on your talent. 2. There will be a total of six (6) judges.